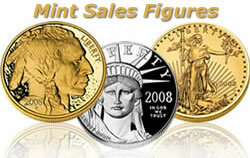 Collector gold and platinum coin sales have been ablaze with eight sold out options since last week’s U.S. Mint sales figures were released. The final two one-ounce and one-half ounce uncirculated gold Buffalo coins departed over the weekend, and the last one-half ounce proof Buffalo went Monday afternoon with a surging 58.5 percent increase in sales over the previous week. In addition, the proof American Eagle platinum one ounce, one-half ounce and one-quarter ounce options sold out Tuesday morning, the one-tenth ounce on Wednesday, and the four-coin set just this morning. Not too surprisingly, while the one-ounce 2008-W American Eagle Platinum uncirculated coin sold out on December 3, the final sales had not been registered in last week’s Mint figures. This week shows another 429 coins have been sold. Expect similar increases for some of the eight bullions coins no longer available. The CoinNews collector tool page U.S. Mint Collector Bullion Coin Prices, Premiums and Sales Figures has been updated with the latest prices, coin premiums over bullion spots, and Mint sales figures. The tool can help locate the better priced and more scarce coins.